People buy dog boots for their furry friends all the time. They can be a great way to show off your best friend’s hot new style, but dog boots can be much more than that. They can be a great way to protect your dog’s paws, give your dog more traction, and it can even help reduce stop your dog from tearing up your yard. There are tons of benefits to dog boots, especially in the winter. Need to take your dog out on a walk, but there’s snow on the ground, and it’s obviously freezing out? A pair of dog boots will keep your furry friend warm while you take him or her on their daily walk. There are a lot of cheap dog boots out there, however. Unfortunately, that usually means you’re getting a pair that isn’t going to last, or isn’t going to stay on your dog. If you want to make sure that you’re getting a pair of dog boots that stay on, you’ll want to follow along with us below. We’re going to show you all of the top pairs available today. If you’re looking for the best of the best in dog boots that stay on, you can’t go wrong with the Grip Trex. These protects dogs’ paws from extreme environments, including severe cold weather. Dog having trouble obtaining traction at home on slippery floors or outside? That’s why these have a vibram non-marking outsole with a rugged lug design. It provides flexibility and traction on varied terrain and surfaces. 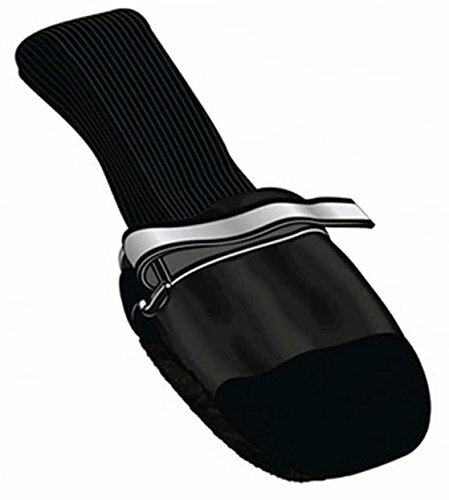 Put these on, and they might appear tight on your dogs’ paws; however, the tightly woven air mesh is breathable, keeping your dog’s paws comfortable while keeping dirt and debris out. 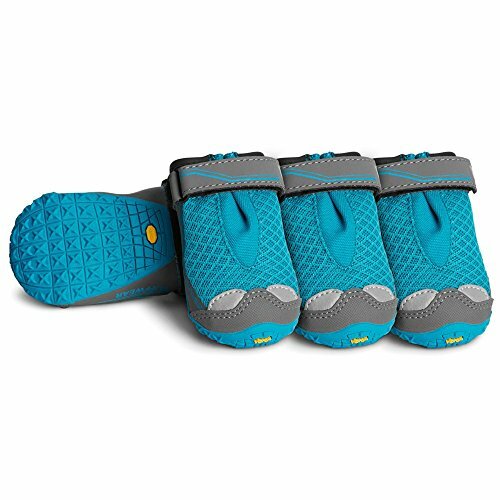 Ruffwear says these fit dog paws with a width of 2.75-inch. Let’s face it — as far as dog boots go, the Grip Trex are a little pricey, even for those that adore their furry friend. So, if you want a cheaper alternative, you can’t go wrong with what QUMY offers in their waterproof shoes for dogs. 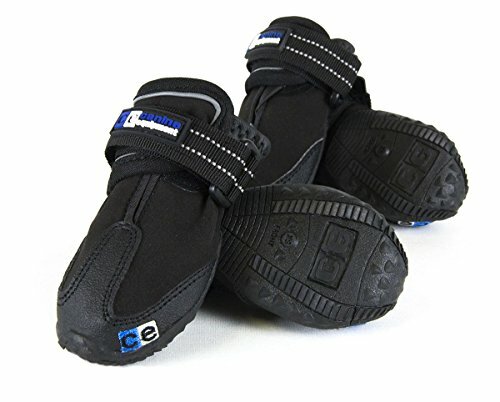 These are secure and adjustable dog boots that are easy to put on and pull off. 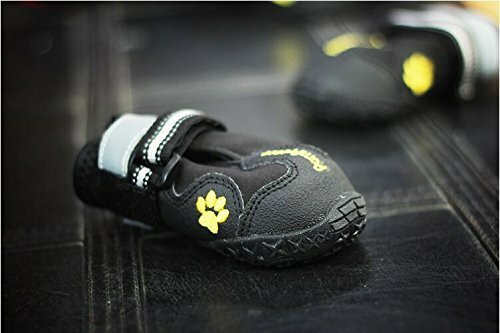 These dog shoes expands with a wide split seam opening, and even have two adjustable and reflective velcro straps to not only ensure a tight fit, but keep your dog visible at night. 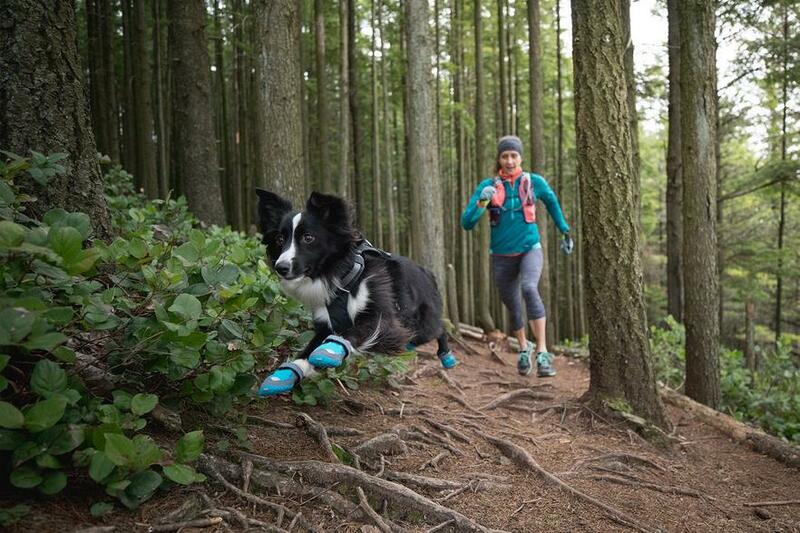 They’re also cheaper, and have a tough, rugged bottom to give your dog more traction. Coming up in third position on our countdown are dog boots from Canine Equipment. 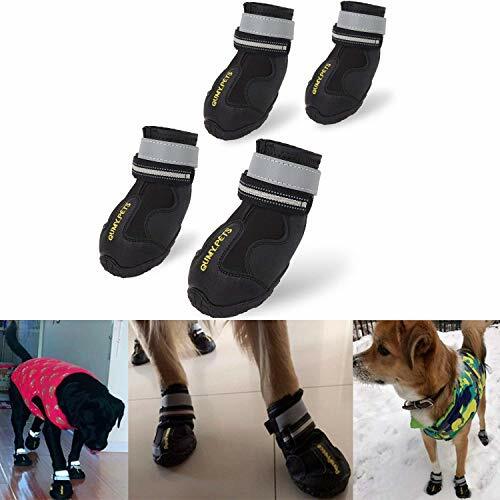 These are great for protecting you dogs feet from sharp rocks, twig, branches, hot pavement, extreme cold, and more. Canine Equipment offers them in a variety of sizes, from as small as X-Small to a range leading up to X-Large. These are all-terrain boots that aim to improve traction. They’re great or winter because they are water resistant, breathable, and don’t fall off while running through the snow. In second on our countdown, we have this excellent pair of dog boots by Pet Labs. We like these because the boots are very flexible, conforming to the shape of your dogs paw. It makes it a more comfortable experience for your furry friend, and makes it so that the sizes can fit multiple pups. These are easy to put on and take off of your dog. On top of that, they come with reflective velcro straps that are visible at night, keeping your furry friend safe during those night walks. With a waterproof material, these are ideal in rain or snow as well. And finally, we have our number one favorite — the All Weather Boots by Muttluks. Just like the Canine Equipment, these protect your furry friend’s paws from hazards like hot pavement or sand, burrs, ice, snow and salt. It makes it a whole lot easier for your dog to run and play outside. These have treated leather soles, which help provide a more flexible and comfortable fit for your pup. As you can see, there are a lot of excellent dog shoes that stay on out there. Our favorites are from Pet Labs and Muttluks, though we really like what the Grip Trex offer; however, those are quite pricey, but have the best performance. Do you have a favorite pair? Sound off in the comments below!